Brandi Morin uses her clothing line to provide a learning opportunity for her customers. 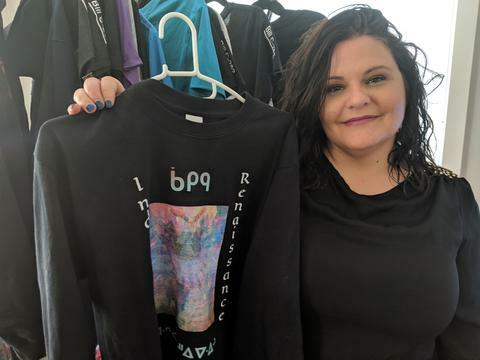 On leggings, hoodies, hats and even baby onesies, the founder of Mixed Blood Apparel incorporates Cree, Mohawk and syllabics in her designs. Morin, who is of Cree, Iroquois and French ancestry, said she had little exposure to Indigenous language growing up. Her kohkum (grandmother) spoke some Cree, but the elder woman who attended residential school as a child wasn’t fluent in her language. However, a powerful thing happened near the time of kohkum’s passing 10 years ago. The language that lay dormant inside her flooded back. Morin’s kohkum began “speaking blessings” over all of her children in the Cree language. Morin launched Mixed Blood Apparel in November 2018 during her maternity leave from work as a journalist. Her goal with the brand was to “reach this generation” to inspire a revitalization of the language. “It started with a T-shirt,” said Morin, and grew with the Kohkum Story Leggings, which are based on Morin’s grandmother’s handwritten texts. And then the line took off. Morin said it’s a good time for such a brand, with 2019 being the United Nations International Year of Indigenous Languages. It is a call for governments, institutions, communities and individuals to take action on preserving Indigenous languages, which are dying at an alarming rate. She said there is a hunger for such learning. The start-up was done with minimal investment, said Morin. And financing remains a struggle, but she encourages people not to let a lack of funds keep them from pursuing an idea or a gift to share. Make it into a business, she encouraged.